This eBook is available on Amazon – you don’t need a Kindle or any special readers – Amazon provide a free App enabling the book to be read on any device including smart phones. 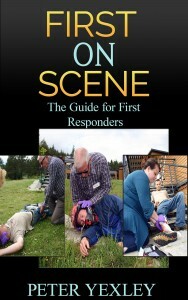 First On Scene – a guide for first resonders; written by Peter Yexley, a first responder with the NHS Ambulance Service for five years and is an Event Medic, qualified First Aid Instructor, Level 3 member of the Faculty of Pre Hospital care at the Royal College of Surgeons Edinburgh, Associate Member of the College of Paramedics, Member of the Association of First Aiders and Accredited Service Medical Professional. The book is aimed at anyone involved or indeed wishing to be involved as a First Responder. It has188 pages divided into chapters then into subjects. Not only does it cover all the elements of First Person on Scene (FPOS) it delves into topics in much more detail, focusing on the personal safety of the First Responder to ensure they deliver life saving measures with mininum risk. Many have purchased this book prior to an interview or indeed a test/exam whilst others have purchased as a reference guide for what to do in certain situations – the perfect refresher!